A new video documenting the adventures of manatees Rita and Georgie has been released on Conch Salad TV. Rita was discovered in 2010 in Spanish Wells Harbour, pregnant with Georgie. The residents of Spanish Wells adopted her, but after Hurricane Irene, Rita and Georgie disappeared, later turning up in Nassau Harbour. Concern for their safety prompted Atlantis to rescue the manatees and bring them to a holding tank on their grounds. From there a number of organizations, including the Bahamas Marine Mammal Research Organisation, the Department of Marine Resources and the US Geological Society got together to create an international team to do what was best for the manatees. The story of what happens next was documented by Bahamian production company Loggerhead Productions for the Bahamas Marine Mammal Research Organisation with funding from the Lyford Cay Foundation.A new video documenting the adventures of manatees Rita and Georgie has been released on Conch Salad TV. Rita was discovered in 2010 in Spanish Wells Harbour, pregnant with Georgie. The residents of Spanish Wells adopted her, but after Hurricane Irene, Rita and Georgie disappeared, later turning up in Nassau Harbour. 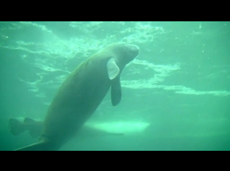 Concern for their safety prompted Atlantis to rescue the manatees and bring them to a holding tank on their grounds. From there a number of organizations, including the Bahamas Marine Mammal Research Organisation, the Department of Marine Resources and the US Geological Society got together to create an international team to do what was best for the manatees. The story of what happens next was documented by Bahamian production company Loggerhead Productions for the Bahamas Marine Mammal Research Organisation with funding from the Lyford CayFoundation. For more information visit the Bahamas Marine Mammal Research Organisation’s website. Make sure you don’t miss the next video: “like” Conch Salad TV on Facebook, or join us on Twitter!